Monte Cristo Sandwiches. A cross between a sandwich and french toast. 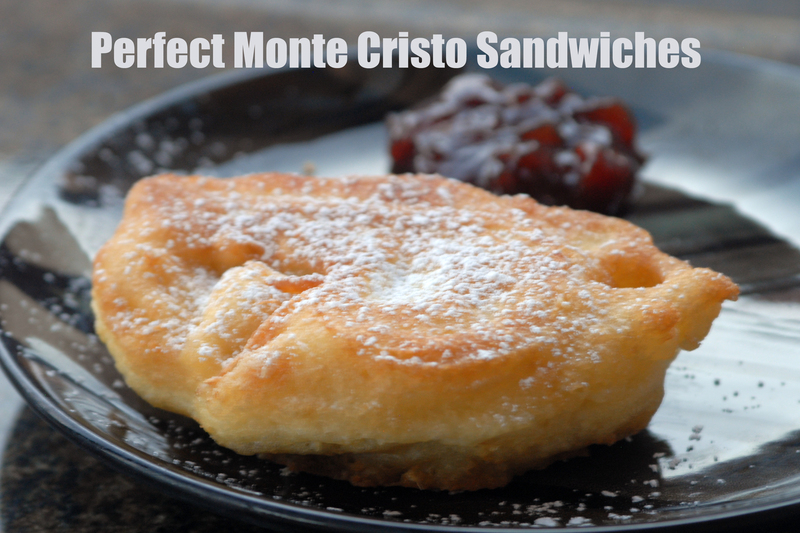 I decided to make them for dinner tonight, and was disappointed that most recipes I found just had you dip the sandwich in egg or egg+milk…that wasn’t sufficient for me…A real, true, delicious Monte Cristo has been battered, then fried. It should taste like carnie food, imo. I found this recipe, which I used as my jumping off point, and created a family-pleasing sandwich that is equally as delicious with or without jelly (I like mine with). According to what I have found online (*cough* wikipedia), the Monte Cristo should be ham and cheese (though many recipes add turkey). It seems that traditionally, Gruyere or Swiss is used. Personally, I’m not a fan of swiss. Tonight, I used provolone, because it’s one of my favs and I don’t typically have Gruyere on hand. Many recipes claim that currant jelly on the side is most proper, though I find no historical claim for this. We used strawberry. You can use mayo or mustard on these sandwiches, if you desire. I left mine dry, because my kids are all picky and I was making them all the same. The amount of ham, cheese and bread you use will depend on the size of your bread. I used one sliced loaf of grocery store french bread, the slices were pretty small, and it made 11 smaller sandwiches, enough for almost everyone in my family to have two. Whatever you use in your components, it’s a delicious tasty treat and a fun change for dinner…or breakfast. Form your sandwiches. Each sandwich, depending on the size of your bread, will use 1-2 slices of ham and a half-slice of cheese. Attempt to keep the meat and cheese inside the borders of your bread. If you want to, you can cut the crust off your bread, this helps the batter stick to the sides. Make the batter: Whisk together the eggs and milk in a wide shallow container (you will use this for sandwich dipping). In a separate bowl, combine the flour, baking powder and salt. Add the dry ingredients to the wet mixture and whisk until smooth. Heat your oil over medium-high in a deep pan until a small piece of bread dropped in starts to bubble immediately. After your first batch, you may want to turn the heat down to medium. Use enough oil that the oil comes up at least half-way up the side of each sandwich. Flatten each sandwich with your hand, and one by one, dip into the batter, turning it over and fully covering the sides. Using tongs, hold the sandwich over the batter for a few seconds to let any excess drip off, then place in your prepared pan. Fry 1-3 at a time, depending on the size of your pan. Flip each over once it is golden brown on one side and cook the other side. Remove each sandwich to a plate covered in paper towels. 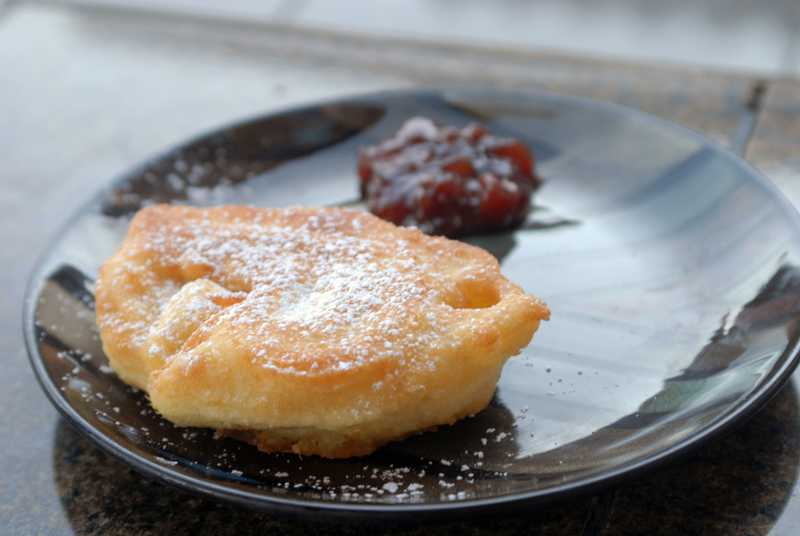 When all are fried, place in a single layer on a plate and sprinkle with powdered sugar. Serve with jelly on the side, if desired. Use uncured ham. There are some great brands in the deli aisle of the grocery store, like Hormel’s Natural Choice, and many gorcery stores have their own brands of “natural foods’ which include uncured meats. you can also find uncured ham at many deli counters. I know that Boars Head has one available. Check your french bread for additives. Make your own if you have time. Here’s my recipe. 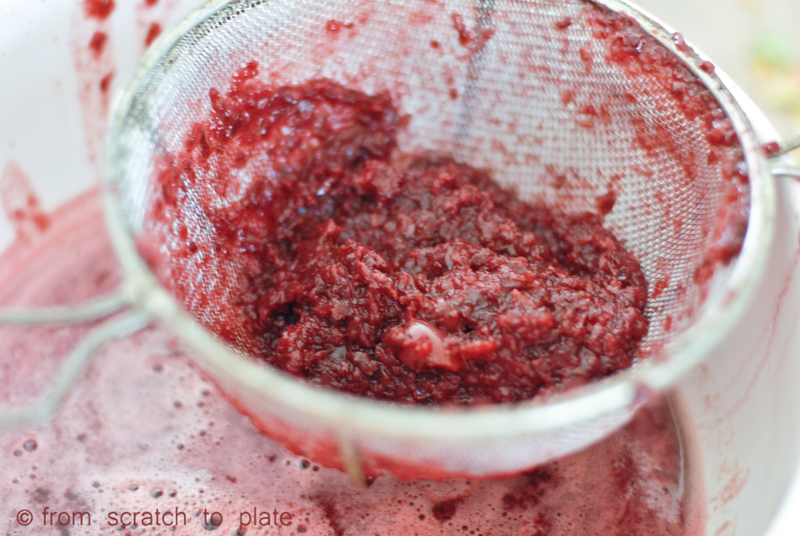 Use a natural jam or jelly to avoid corn syrup. This isn’t a very allergy-friendly recipe. Wheat, gluten, dairy, eggs. You can get around dairy by subbing for the milk and not adding cheese. 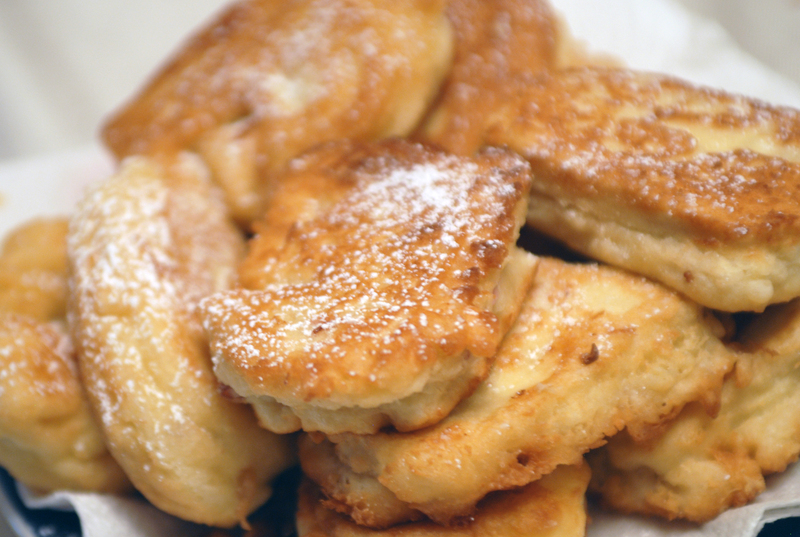 I haven’t tried this recipe with GF bread and flour, so if you do, let me know your results! I know, I know. AUGUST!!! Seriously? That was my last post? The fact that I haven’t posted in so long haunts me. I have a good reason, really. I’m in school. Yeah, well…I was in school when I started this blog. But, somehow, being a wife and mother of four young children and in school full-time and having a food blog wasn’t enough…I had to start a business, too. Yes, I am insane. I planned to wait until after graduation (in TWO WEEKS…WOO-HOO!!) to start my business, but I wanted the holiday sales. Needless to say, my business has been humming, I am busier than I’d like to be, but being grateful for the income and the success so far. I hesitate to post the business here, since it is only local at the moment, but here it is: rebelrolls. Of COURSE it’s food-related. This week I have two orders and a holiday fair I’m selling at, so I’ll be making about 14 dozen rolls this week…plus school work and a final. Wish me luck! When I can breathe again, I have some awesome recipes to post. Thanks for being awesome and still reading this blog. A special shout-out to a facebook fan, Erica, for calling me out and making sure I was still alive. Sorry I haven’t posted in a while. I’ve been in a sugar coma. You may have noticed that many of my recent posts have been sweets. 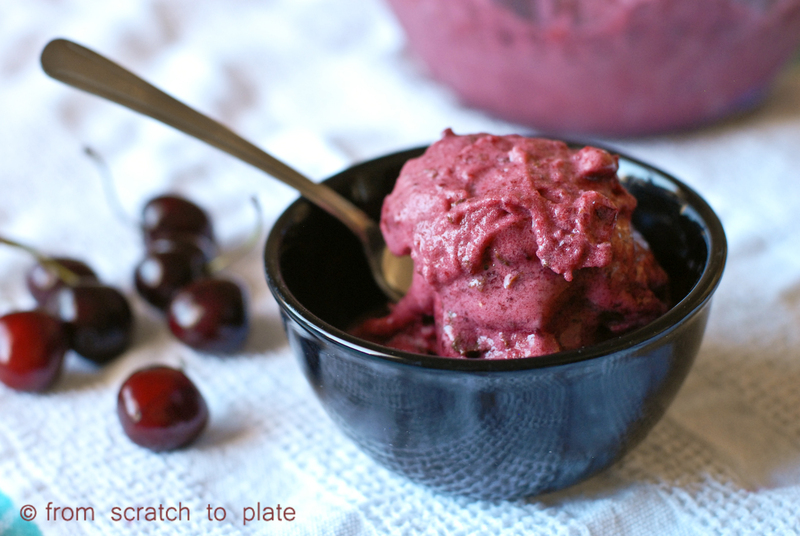 I have a ton more goodies to post, but I felt a tad guilty about posting so many recipes using processed white sugar, when my goal is to help people get OFF processed foods. Processed sugar is my one huge weakness (meaning: addiction). It’s also my kryptonite. Unfortunately, when I’ve had the time and energy to make a fabulous blog-worthy dinner, I’ve rarely had the patience to hold off four starving kids and a starving hubby long enough to take pictures and such. Desserts are another story. I can make them any time of day and take pretty pictures. But, I finally pulled it off and took some decent pics of this dinner before serving it. But, please forgive me if the next 20 posts are all desserts. 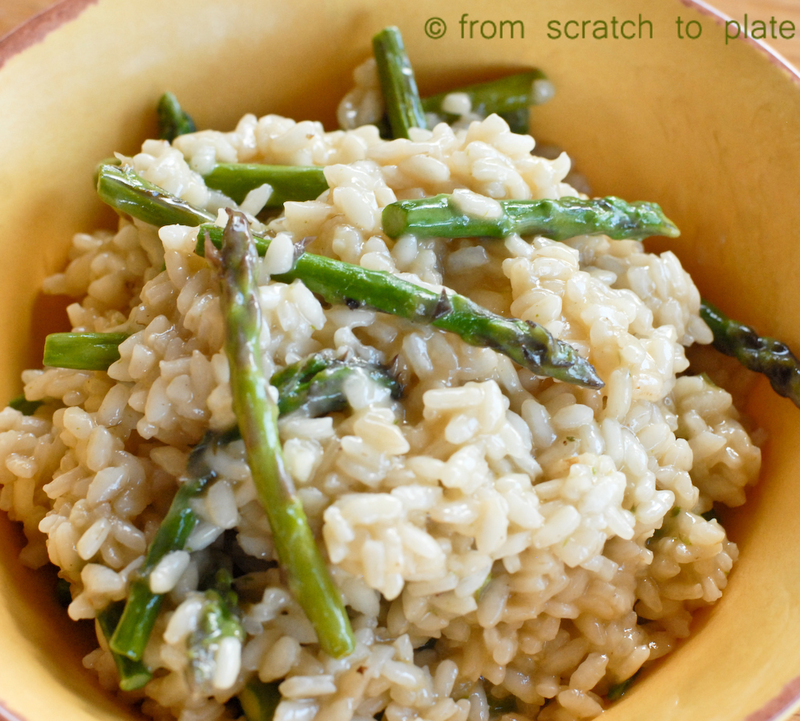 Risotto: risotto is a high-starch, short-grained rice. It is cooked differently than normal rice. 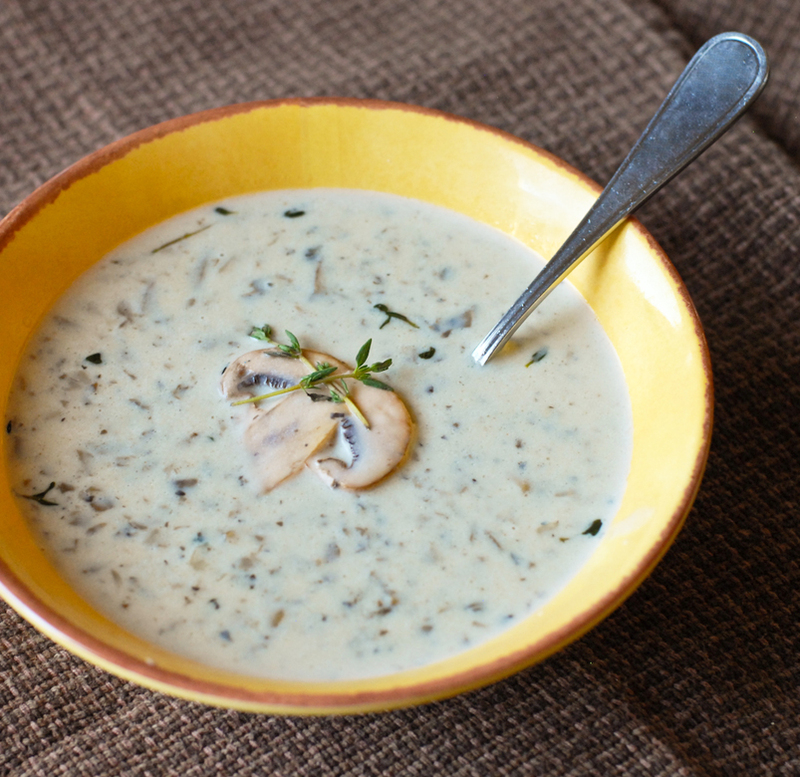 It is first browned in oil, then cooked in broth, stirring continuously while adding the broth in small amounts. Honestly, the first time I made risotto, I said to myself “you’ve got to be kidding! that’s a lot of work!”, but it really isn’t that bad. I had a good book I was reading, and just read while stirring. 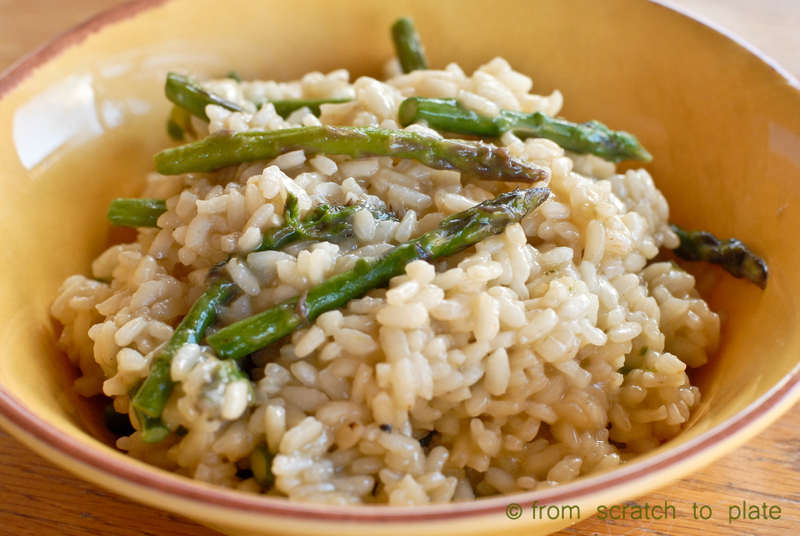 You will find risotto rice, typically the arborio variety, in the specialty food section of your grocery store. My local store has an Italian section that has specialty items from Italy, like extra expensive olive oils, sauces and vinegars. That is probably where you’ll find the arborio rice. 1/4 cup fresh Parmesan cheese, grated (do NOT use the cheap powder stuff you get in a can, go to the cheese section and get real parm). Rinse and trim the asparagus. Do this by removing the bottom inch or so and discarding. An easy way to do this is to hold the spear upright and bend it down from the top until it breaks off. Where it naturally breaks off is where it goes from tender to fibrous. I usually do this to a few at a time, then put them back in the bunch and cut off the bottoms of the entire bunch where those few broke off. I hope that makes as much sense to you as it did to me as I was writing it. In a large heavy skillet, heat the olive oil over medium heat. Add the asparagus and stir fry until cooked but firm (where you can fairly easily snap it in two with whatever utensil you are using to stir fry it, but before it becomes soggy). Remove the asparagus to a plate, reserving as much of the oil in the pan as possible. While cooking the asparagus, heat up your chicken broth, either in the microwave , or in a saucepan. Add the garlic and the arborio rice to the hot pan. Stir fry those with for 2-3 minutes, until they start to brown. Stir in one cup of hot broth. Start your timer, setting it for 14 minutes. Stir and cook until broth is almost completely absorbed. Add another cup of broth. 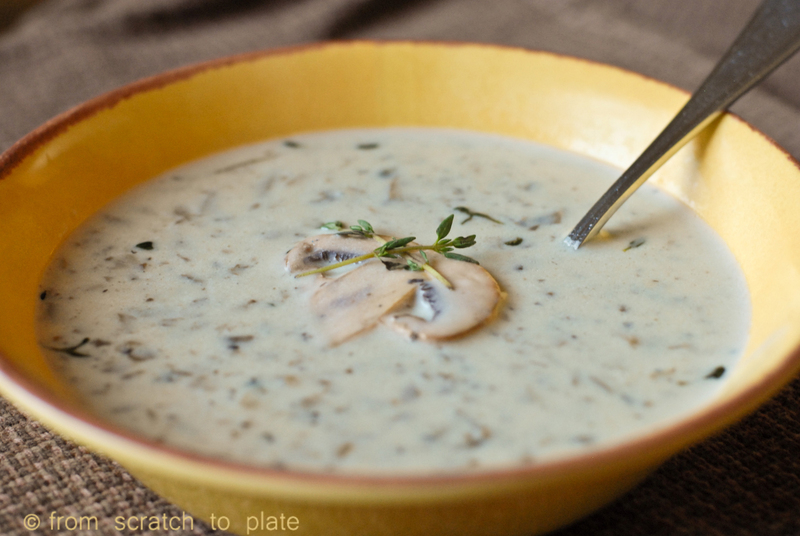 You will continue to add the broth by cupfuls, stirring until each cup is absorbed before adding the next. You will use between 6-7 cups of broth, and the total time will be between 14-20 minutes. At about 14 minutes, start testing your risotto. It should be “al dente”, which means it still has some substance, it doesn’t dissolve or turn to glue in your mouth, but isn’t crunchy or chewy. If it seems a bit hard, continue adding broth and testing every couple of minutes. When you believe it has the right cooked texture, remove from the heat and add the butter and Parmesan cheese. Stir until both are melted and incorporated. Add in the asparagus and serve immediately. This recipe is about 6 main portions or 12 side portions. REAL food alert: please, please, please use real parm cheese. Pretend you have never heard of Kraft canned parmesan powdery cheese. Trust me. Also, check your chicken stock for additives and msg. ALLERGY alert: you can leave out the butter and cheese, but it won’t be as creamy. A non-dairy margarine could be used, or a dollop of coconut oil (though the taste may bug you). It was a sunny summer Arizona day. I was a bored 13-year-old who had a serious hankering for something sweet. I had all day with nothing to do, most of my family were off doing whatever fun activities they had set up for themselves. I decided to attempt to make cinnamon rolls. My mom made them occasionally, so I dug out her recipe and was off on my very first yeast baking experience! As I measured out the flour and kneaded the dough, I thought, “This is easy! I could make these everyday!” I left the dough to rise. The recipe said “double”. Forget the fact that I am horrible at visual estimation, I figured 20 minutes or so would be a good amount of time, so I could get them finished before my sisters got home. After about 25 minutes, it looked like it had risen a lot…maybe it was about double. I rolled them out (Hmmm…how thick? How thin?). I spread the melted butter and did what the recipe said to do: sprinkled sugar and cinnamon. I rolled them up and cut them and put them all side by side in one 9×13 pan. Wait, I have to let the rise AGAIN? Sheesh… *Sigh* By this time I am dying to eat these things, and it has already taken FOREVER to make them up to this point (remember, I’m 13…an age not known for it’s patience). I let them sit for about 10 minutes and am delighted that they look all puffy and risen. I preheat the oven and pop them in. I’m so excited to pull them out of the oven, and top them with a basic buttercream frosting (yeah, I think my sisters and I all learned to make a chocolate buttercream frosting before we could talk) and EAT THEM! Mmmmm, these are amaz…amazi…amazingly hard. Like hockey pucks. And flavorless. It would be many, many, many, many years before I would attempt to bake with yeast again. Through my cooking and baking adventures, I commonly hear from people “I can’t make anything with yeast”. I completely understand. I had more failures than just that teenaged cinnamon roll disaster, and I finally just decided, “I’m not a yeast baker”. Somehow the yeast baking gene skipped over me. 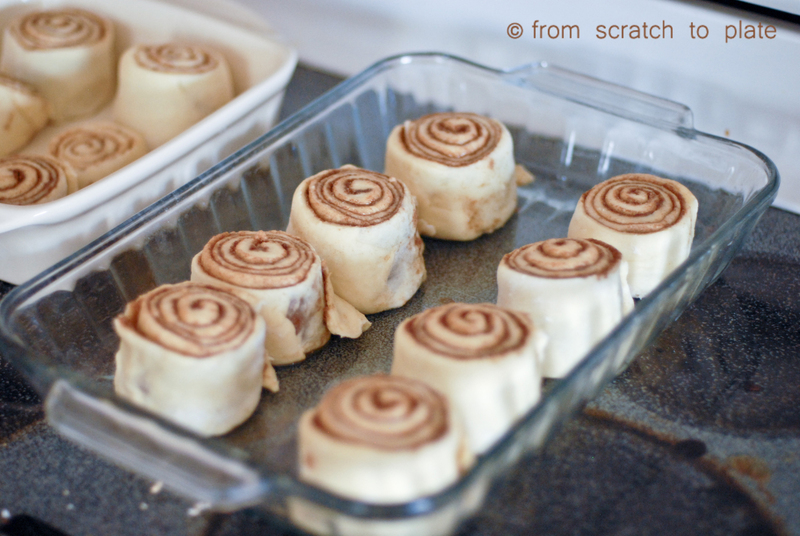 In college, one day, I wanted homemade cinnamon rolls. I said to myself, “People make homemade cinnamon rolls all.of.the.time. Why in the heck can’t I?” I set out to follow a recipe to-the-tee and see if I could pull it off. I did. They were fabulous. They weren’t perfect, but finding a recipe with precise directions that I followed exactly helped me get a feel for yeast baking. Over the years, as I overcame my fear of yeast failure, I’ve become pretty darn good at it. The key to yeast baking is experience. That means lots and lots of failure. Lots of hockey pucks and doorstops and fallen breads. The more you experience the dough, the yeast, and how they react in your environment and your oven, the better you’ll get at it. This is turning out to be a super long post, so thanks for sticking with me. CINNAMON ROLLS (that was for those who skipped all the above part and wanted to get to the pertinent info). Here’s the thing with cinnamon rolls: patience. Make them on a day you have a lot of time, you’re not in a hurry. You need to make sure they are rising as much as needed. Second: roll them thin. 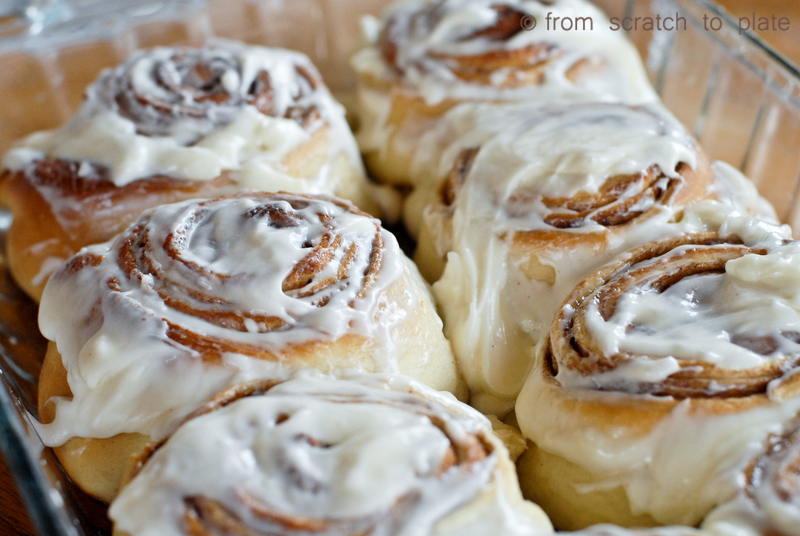 You know those cinnamon rolls you get in the mall? They have a ton of layers, and they are nice and soft and gooey. That’s from rolling it super thin so that you get lots of thin layers. Third: do not over stuff the pan. You’ll notice in my pictures that I only put eight rolls in a 9×13 pan. Yeast rolls actually get three times to rise. First, when you double the dough. Second, after shaping, you let them double in the pan. Third, when they cook, they expand again. If you have extra space around them, it gives them lots of room to expand, which results in a softer end product. You also want to frost them hot, straight out of the oven. 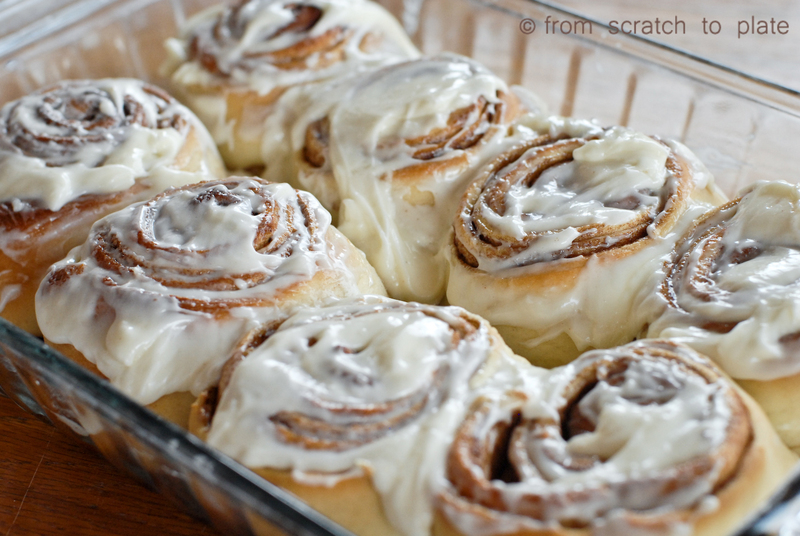 The frosting will keep the rolls soft as it seeps into the hot roll. Make sure every exposed surface is covered. If you haven’t yet, take your eggs out of the fridge so they can warm up to room temperature. In a bowl, or your stand mixer, combine the milk, yeast and sugar. Let sit for 5 minutes, until it is frothy. Meanwhile, melt your butter and let it cool a bit. Stir the butter into the yeast mixture, then add in the eggs and stir to combine. Stir in 3 cups of the bread flour and the salt. Add the remaining flour 1/2 cup at a time until the dough just comes together. Do not add too much flour, or your rolls will be tough. Knead for 5 minutes with your dough hook, or for several minutes by hand, until the dough is soft, elastic and bounces back when you touch it. 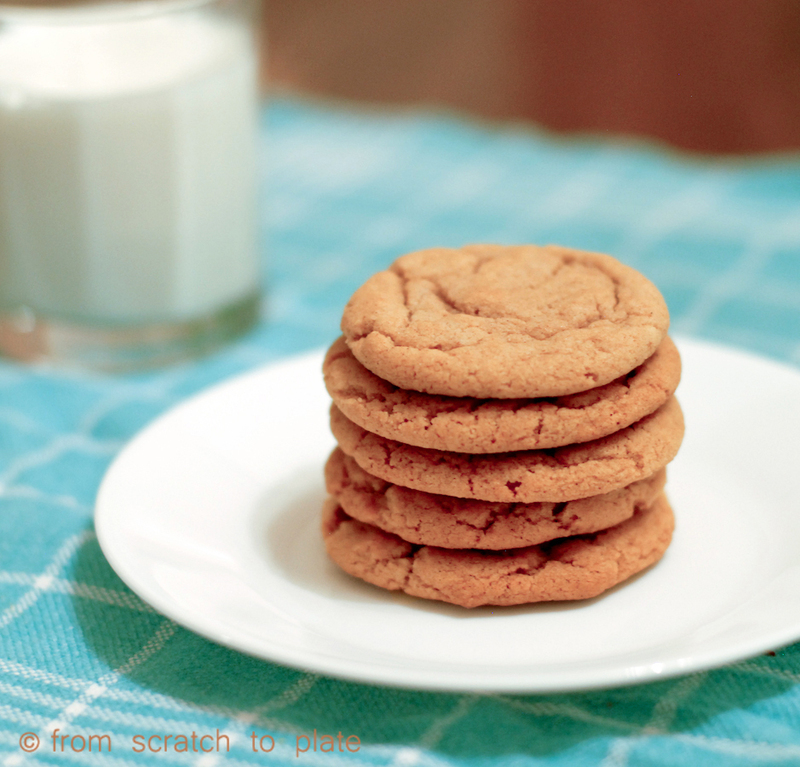 If you are using a stand mixer, the dough should stay on the hook and not stick to the sides of your mixing bowl. You may need to sprinkle extra flour in every so often to keep it from sticking. Place a towel over the bowl and let sit and rise until double, about an hour. 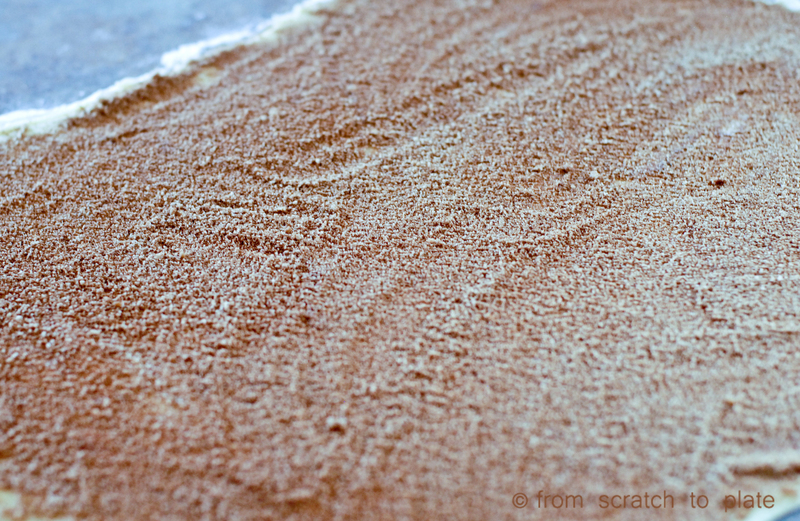 Dump the dough onto a lightly floured surface. 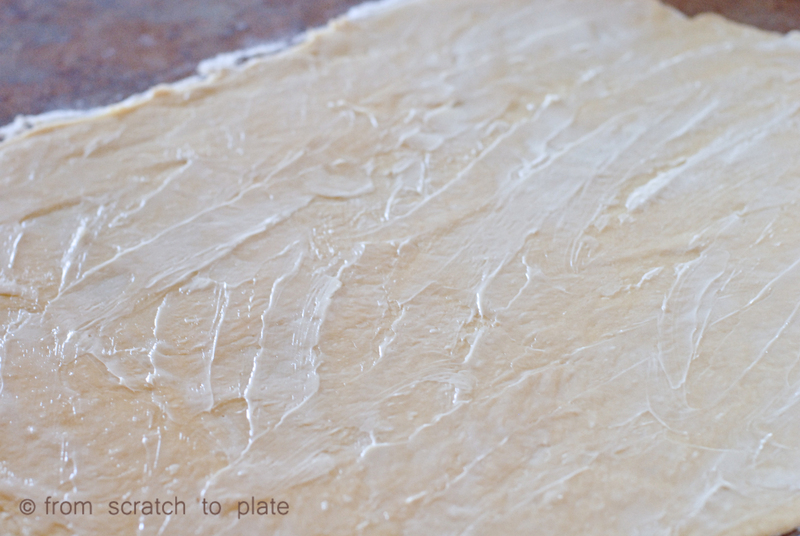 Roll dough into a 16×21 inch rectangle. This is easier said than done, it takes some practice, but don’t worry too much if it has uneven edges. The key here is not the measurement given above, but that it is rolled thin. It can be bigger that 16×21. In a small bowl, mix together the cinnamon and brown sugar. 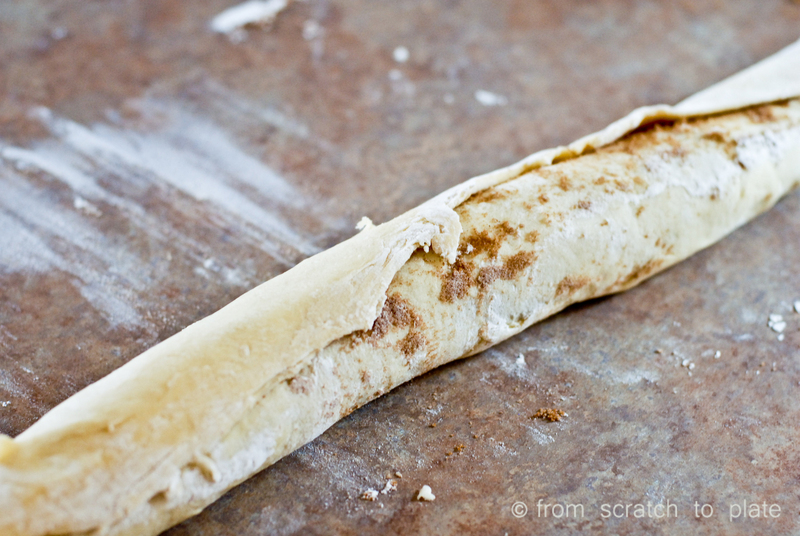 Use a rubber scraper to spread the soft butter across the surface of the dough. 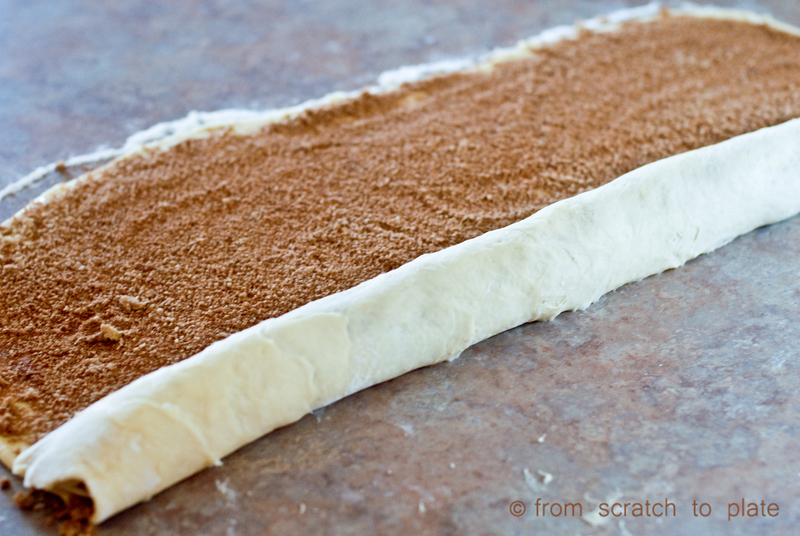 Leave a 1/2 inch border just on the side farthest from you, where you will seal the roll of dough, free from butter. Evenly spread the cinnamon mixture on top of the butter. Starting at the long edge, start to roll the dough. You want it fairly tightly rolled. I tend to stretch it a bit as I go, pulling the roll towards me as I go. It’s normal to have to do one side, then the other. 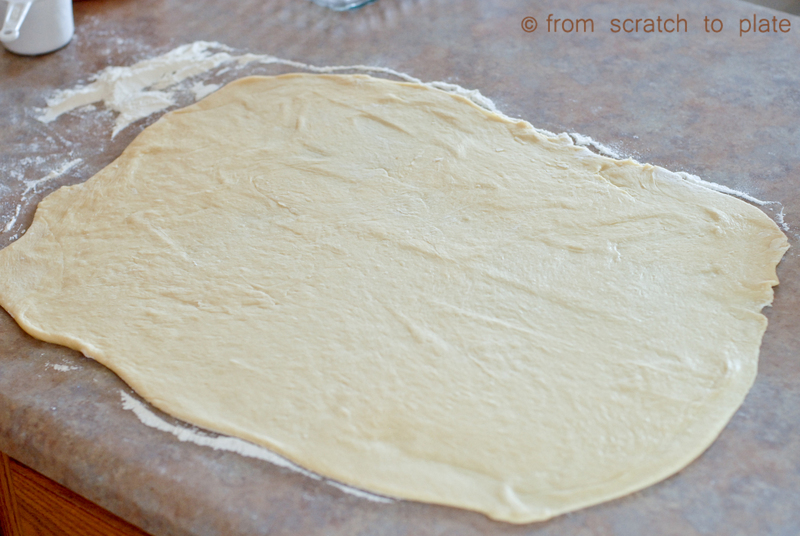 This is a nice, soft dough and will take some finessing to get it to roll evenly. Don’t worry if it’s lopsided. When you get to the end, pinch the edge shut as well as you can. Place the seam side down. Cut the jagged edge piece off each side. Don’t throw them away, those are rolls, too! Now, cut your nice, neat roll into 12 equal portions. I usually cut the log down the middle, then in quarters, then cut each quarter into thirds. 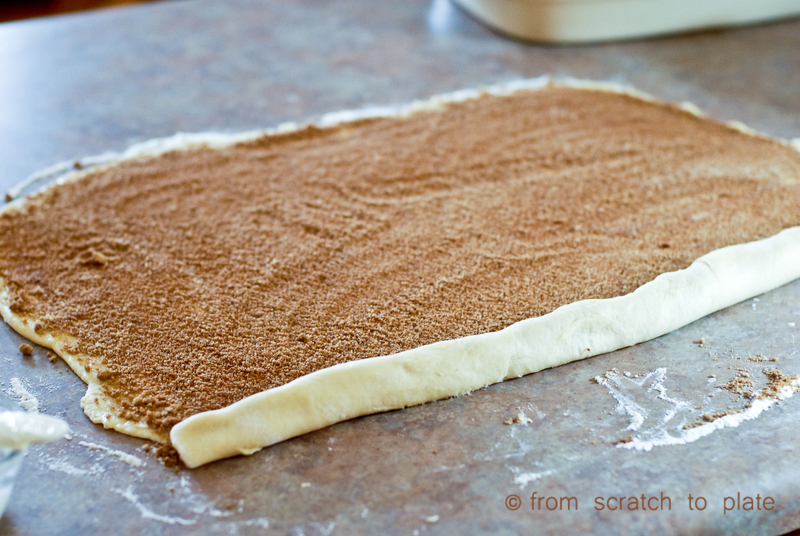 You will see all sorts of tips on cutting cinnamon rolls. The only trick you really need is to use a serrated knife (the kind with a jagged edge), and “saw” the rolls, do NOT press down with the knife, or you will mash them. If you lightly saw them with a nice, sharp, serrated knife, you won’t have any problems. Spray your pans with cooking spray, or lightly grease with some oil. I typically use one 9×13 pan and one slightly smaller oblong pan that fits six rolls (remember, you have the two edge ‘reject’ rolls). You can use a 9×9 pan and ditch the reject rolls if you want, or depending on their size, combine then into one roll and place it in the middle of the 9×9 pan. You want to only put 8 rolls in the 9×13 pan, and the remaining 4-6 rolls in whatever other pan you choose. Cover each pan with a towel and let rise again, about 30 minutes. Preheat your over to 375 degrees. Bake the rolls for 15-18 minutes, until light brown and moist, but not doughy on the inside (just use your psychic abilities, or use a fork to kind of pull the middle of one roll to one side to see the texture of it). While the rolls are baking, or while they are rising, or whenever (you could pre-make this frosting and freeze it, if you want), whip together the cream cheese and butter until smooth. Add the powdered sugar and vanilla and beat until light and fluffy. Immediately frost after removing them from the oven and let cool 5-10 minutes, so you don’t scorch the inside of your mouth (this is the hardest part of the recipe). If you want fresh baked rolls for breakfast (we have them every Christmas morning), you can make these and freeze them after shaping (just get the disposable foil pans and put 6 in each pan). Pull them out of the freezer the night before and let them defrost and slowly rise in the fridge all night. 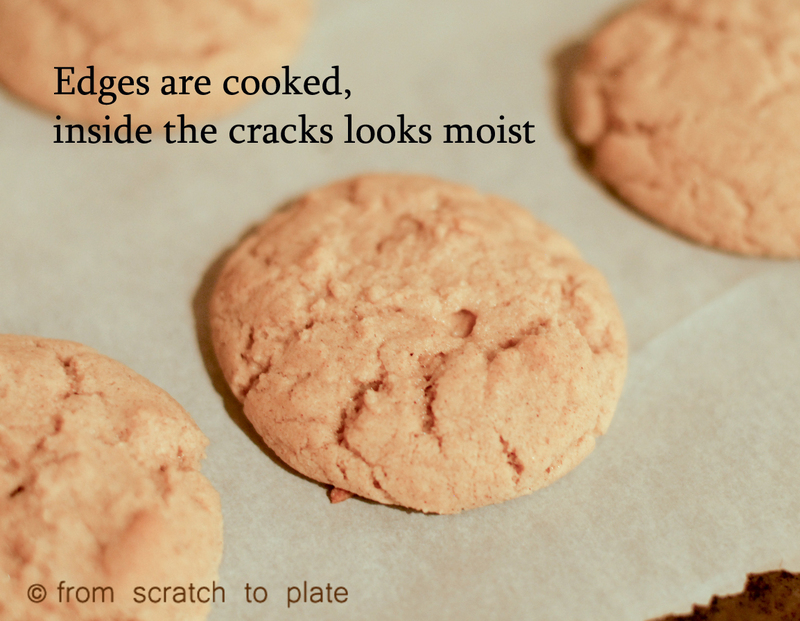 Pull them out of the fridge when you wake up, preheat the oven and bake. 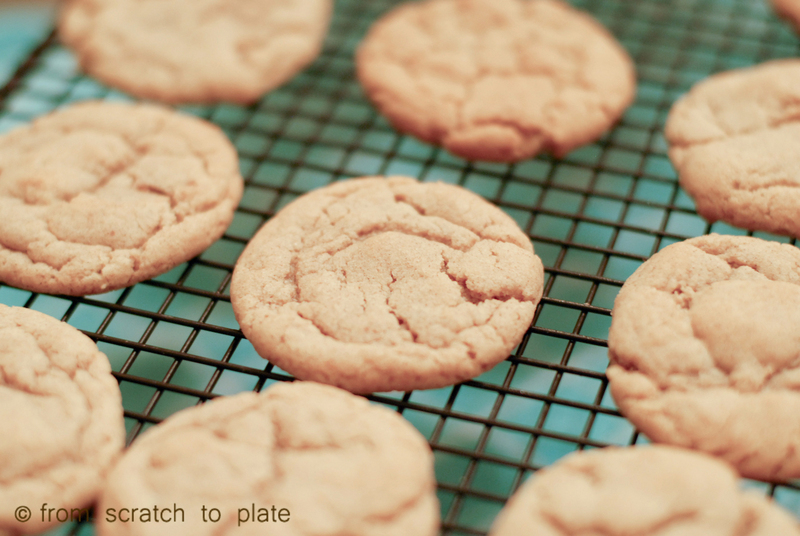 for best results, bring to room temp before baking, but even if you don’t do that, they’ll still be amazing. See? Not perfect! Still amazingly yummy! Lots of space for these guys to rise. Do shrimp intimidate you? They used to intimidate me. I would only buy them cooked and pink, because the raw ones scared me a little. I eventually started cooking them on occasion to figure them out and discovered that they are one of the easiest and quick cooking protein sources to make. I mean, come on, they’re SHRIMP, even their name tells you how easy they are to conquer. One thing about shrimp…the “vein”. Just so you know…that’s not a vein. It a digestive track. Yep. Think about it for a sec. Got it? Yessiree…That’s poop. No worries, though it’s contained in a little membrane and it comes out really easily. In fact, most raw shrimp that you buy is already deveined for you, and really, the poop is mostly dirt. Shrimp are sold by the size. The number you see on the package tells you how many shrimp you would expect to see in a pound. Plus, they give each size a name. So, small shrimp have 51-60 shrimp per pound, and extra jumbo has 16-20 shrimp per pound. When you look at your shrimp to pick a size, remember that shrimp shrinks a bit when cooked. You have two choices when buying shrimp: cooked or uncooked. Cooked shrimp is pink. If you are selecting shrimp to cook and serve hot, I suggest you use raw. 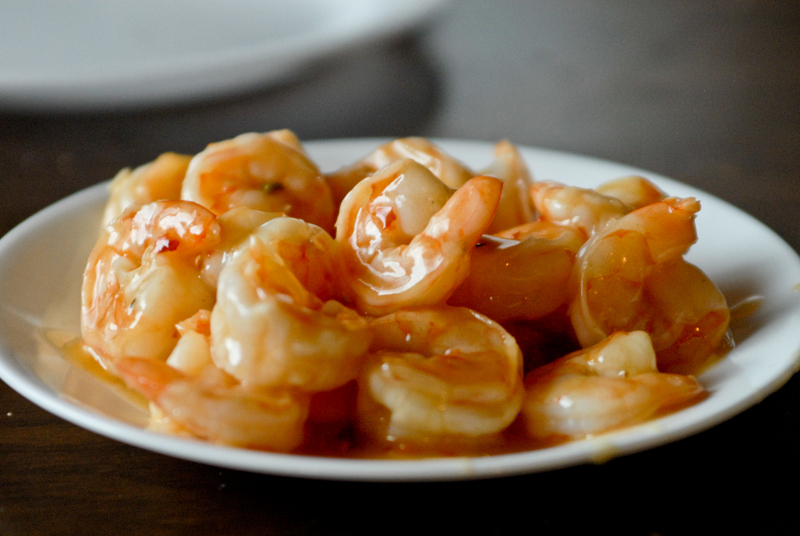 Shrimp cooks very fast, and gets rubbery quickly if cooked too long. Cooked shrimp is perfect if serving cold, in a salad or with cocktail sauce. Raw shrimp is typically just the tail, deveined and the shell is cut, then it’s frozen. To defrost it, leave it in your fridge overnight, or leave it under running COLD water for a while until it’s defrosted. Remember, it only takes a little heat to cook shrimp, so hot water will start to cook it, so will defrosting in a microwave. To remove the shell, hold it by the tail end and pinch it while you pull the meat out. Pinching the end should make the meat pop right out. Now for the question: are shrimp REAL food. Well, of course. Right? Unfortunately, most shrimp you find in the store is coated with preservatives to keep it fresh, including sodium bisulfite, sodium tri-polyphosphate and sodium metabisulfite. You can read more about preservatives here. To find preservative-free shrimp, buy fresh (if you’re lucky enough to live on a coast) or buy from a natural foods market, like Whole Foods or Trader Joes. Be sure to read labels and ask questions. Be sure your shrimp is defrosted, if you bought it frozen. Under cold running water, remove shells and devein them, if necessary. In a large bowl, place garlic, grated ginger, honey, lime juice, chili garlic sauce and olive oil. Mix well. Add shrimp, cover and place in refrigerator to marinate for 1-2 hours. The lime juice will cook and toughen the shrimp if left too long. In a pan over medium heat, place the shrimp and marinade. Cook until shrimp are pink and opaque, about 4-6 minutes. Remove the shrimp to a platter with a slotted spoon. In a small bowl, combine the water and cornstarch until cornstarch is dissolved. Bring the sauce in the pan to a boil and add the cornstarch, stirring continuously until thick. Pour over the shrimp and serve hot. Salt and pepper to taste, if desired. 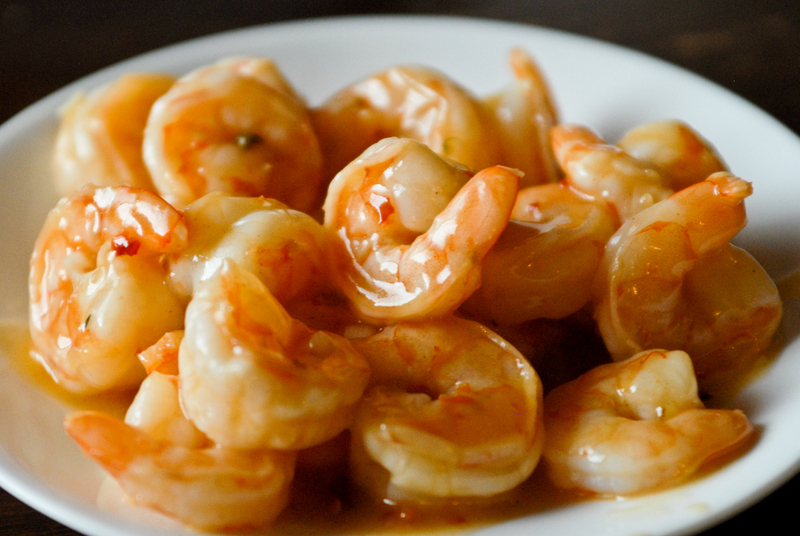 REAL food alert: buy preservative-free shrimp. Check your chili garlic sauce for preservatives. FREEZER alert: you can freeze this sauce and skip the marinating step, just cook shrimp and pour the reheated sauce over it. Did you miss me? This is the last week of summer for three of my four kids, and the first week my teacher husband was back to work. We spent all last week shoving every activity we planned to do this summer into a week-long family activity fest. I have several recipes coming down the pike that I made this summer, but I thought I’d change things up and use this post to tell you how I’m prepping for school to start. The last two years, my kids have eaten hot lunches at school. It made me cringe every time they would come home and tell me what they had for lunch. Last year they even ate breakfast at school. First, let me say that our school serves above-average tasting food. They also allow for unlimited salad and fresh fruit, which is great. Our district also follows our state health policy for lunches. You know, so many servings of vegetables, “low” sugar content, a certain fiber content, etc. I acknowledge that it’s a valiant effort, and it’s definitely better than nothing. But, there are a few problems with it, in my opinion. First, the almighty Dairy Council (cue either angelic singing or a morose funeral durge, depending on your opinion) has lobbied and succeeded to make flavored milk exempt from the sugar content rule. Did you know that flavored milk has at least as much sugar as soda? Your child’s chocolate or strawberry milk has 27-31 grams of sugar per serving. Second, I believe strongly in training a palate. It’s one reason that dieting using processed foods (like, low-fat instead of full-fat pizza) will never succeed in the long run. In my family, I cook home-made, from-scratch, nutritious, flavor-packed meals. I tend to make ethnic foods from all walks of life and expect my children to experiment with taste and enjoy trying new things. My third son’s favorite meal when he was 2? Baked salmon and asparagus. The problem I have found is that within a month of eating school “healthy” food, they lose their adventurous palates and start refusing to eat my dinners. Can you blame them? They are eating processed chicken nuggets and pizza and french toast sticks for breakfast and lunch. Yeah, the pizza has a whole wheat crust and low-fat cheese, and the nuggets are baked and not fried…but it still trains their palate to want to eat that type of food. So, we decided, NO MORE! We are a processed-food-free family, I have to admit that the decision was difficult. We qualify for free meals at the school, so this is an expense we would not normally have, but we believe it is worth it. Both for the health of our kiddos, and for the peace of mealtime, the extra effort is worth it. This post is how I am planning to do breakfast and lunches for my kids, to give them choices and give me less of a headache. # 3: Oatmeal packets: My oatmeal kid’s favorite type is apple cinnamon. I pre-make oatmeal packets using snack-sized ziploc bags. In each I put 2/3 cup whole oats, 1 TBS sucanat, 1 tsp ground cinnamon, about 1 TBS dried apple, cut into small pieces with kitchen shears. Use these just like regular oatmeal packets: add water and microwave for 1-2 minutes. I’ve also made strawberry ones, using dried strawberries. You can make whatever kind your kids like, and control the sugar amount and type yourself. Lunch. The trick to lunch is going to be keeping them from getting bored. The plan is each lunch will have a main dish, a piece of fresh produce, a savory snack, and a sweet snack. The sweet snack is a family favorite. 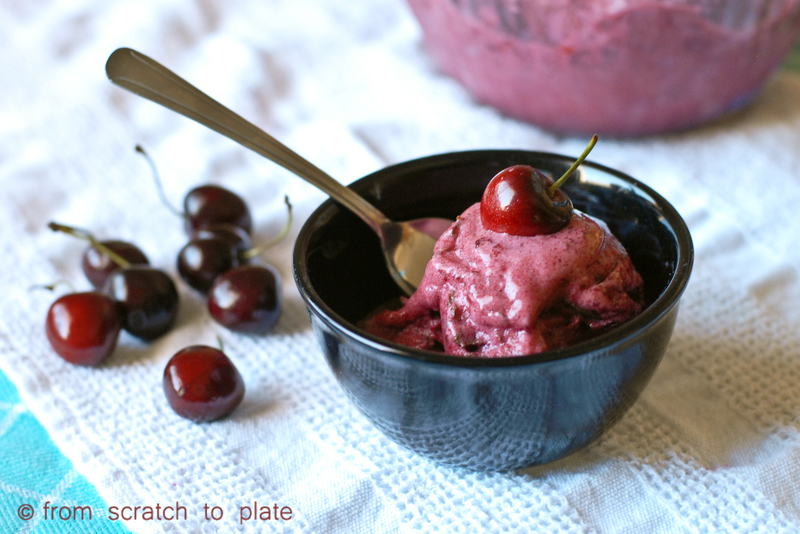 The recipe is flexible and for a sweet snack, healthy in the way that it has no processed sugars, it’s low in sugar, and it’s chock full of healthy fats for energy and brain function. 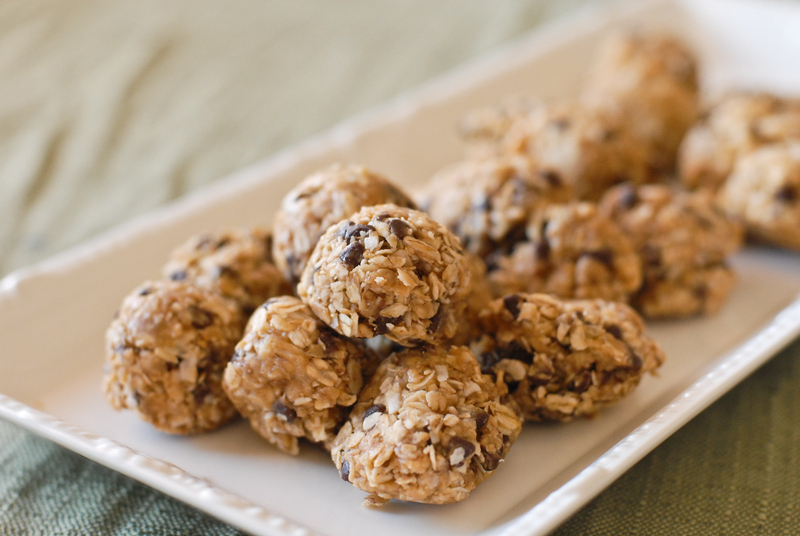 They are called energy bites, and the recipe is below. I make 3-4 batches and freeze them. For school, I placed 3 in each snack bag and froze the bags. Yes, it’s a lot of plastic bag waste, but I’m going for convenience here. Maybe someday I’ll be superwoman and do it all. for now, I’m satisfied feeding my kids healthy, unprocessed foods. Oh, and the reason I put them in individual bags is because it stops my kids (or me) from taking 20 every day, which they would do. They are that good. The produce will be anything they choose from the array we have at all times, typically apples, mini carrots, tomatoes, bell peppers, and whatever in-season snack fruit is on sale (right now, peaches and berries). The savory snack is typically cheese sticks or bags of pretzels. Sometimes, I may make Soft Pretzels, but I typically reserve those for an after-school snack. The main dish, for right now, will be a choice of dinner leftovers, bean burritos (my homemade beans, cheese and salsa in a tortillas and frozen) or “Hot Pockets”, which is my Breakfast Pockets recipe, but each one is a slice of cheese and 1 slice of natural lunch meat (we like Boars’ Head Ovengold turkey breast, and Hormel’s naturals, which has an uncured ham and I just discovered an uncured salami, which has made my 11-yr old’s year). I calculated costs and figured that it’s costing us about $2 per lunch per kid. Not too shabby. So, whether your kiddos are back to school this week, next month or in September, you can start prepping those healthy lunches and snacks now! Mix the peanut butter and honey well. Add dry ingredients and mix until well incorporated. Roll into balls, or use a small cookie scoop (I found this to be easiest). You can refrigerate these and use within a week (Ha! They won’t last more than 2 days), or freeze. REAL food alert: check the chocolate chips for artificial flavors. 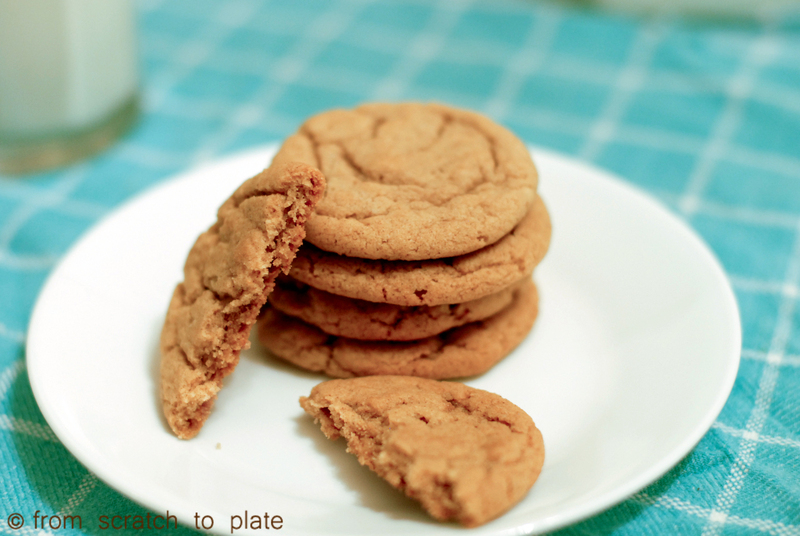 HEALTH alert: to keep these healthy, you really need to use unsweetened peanut butter and unsweetened coconut, otherwise, you might as well make cookies. ALLERGY alert: the peanut butter can be substituted for any nut butter, like almond, or sunbutter (made from sunflower seeds). You can eliminate or swap any of the add-ins (like the coconut, flaxseed and chocolate chips). You can use dried fruit, nuts, chia seeds, or anything else your imagination can come up with (try cocoa!). VEGGIE alert: These are naturally vegan, depending on the add-ins. 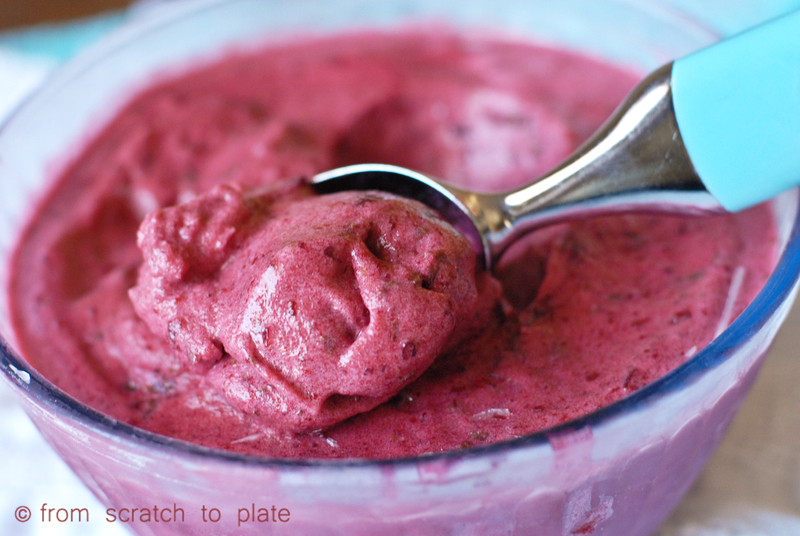 Eliminate the chocolate chips and add in dried fruit or vegan carob chips.